This solution aims to help local governments design better policies in order to improve the lives of their citizens and the business environment. 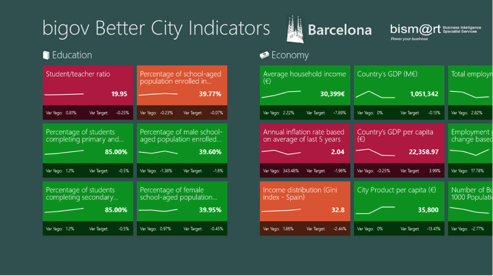 The first version of this application was based-on the Global City Indicators methodology, from the World Bank, and is available to download for free in the Windows Store now. Next generation Dashboard including 196 city indicators inspired by the City Protocol Society and the 37120:2014 ISO. The implementation of ISO Indicators will facilitate the city to access the ISO 37120:2014 corresponding certification. It measures the level of maturity as a Smart City: Comparison with other cities, Comparison of evolution in time with the city itself, Measure the alignment or distance from the particular objectives. This solution shows how attractive the city is to live or to develop a business in. It aims to help local governments to design better policies. bigov Better City Indicators is supported by Bismart on all editions of Windows 10, including Windows 10 Pro, Windows 10 Education, and Windows 10 Enterprise. bigov Better City Indicators is also supported on all servicing branches of Windows 10 and will be supported for the lifetime of the app.